The company hasn’t stopped there. Last year, it introduced a new product which is capturing an even bigger share of the holiday booking market. That product is Staylists – a customisable technology platform that enables brands to sell holiday bookings to their customers. The goal is to connect accommodation owners to large audiences, and simplify the guest booking process. I spoke with Anna Silovsky, Marketing Executive at Inn Style and Staylists, who shared some insight on the progress of the two companies, and what plans are in store for the future. Natalia Chrzanowska: Can you explain the idea behind Staylists? How does the product work? Anna Silovsky: Staylists essentially operates white-label hotel booking sites for big brands, tourism organisations, and national publishers, such as the Daily Mail. Accommodation owners benefit from unrivalled visibility by selling their rooms to these large and loyal audiences for just 10% commission. Traditional online travel agents (OTAs) charge between 15-18%. Staylists wasn’t your first product, though. 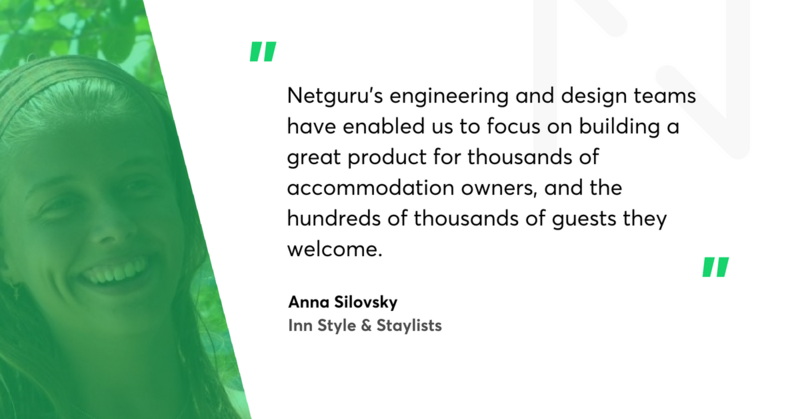 When you first turned to Netguru, you were working on Inn Style. Can you tell me a bit more about how the business evolved, and how you came up with the idea for the new product? In 2011 we released our first product – the PMS Inn Style. It gives accommodation owners complete control over the running of their business – so they can manage their reservations, process payments, streamline guest communication, and download helpful reports. We launched Staylists in 2017 with two clear visions: to simplify the hotel booking process for consumers, and to enable hotels to sell more rooms for less commission. How do these two products stand apart from their biggest competitors? Unlike many of our competitors, Inn Style focuses heavily on design and usability – so the guest booking process is as slick as possible. Our customer service also stands out, as we offer product support around the clock – including weekends and bank holidays. One of our Product Advisors works in Canada, so he’s on hand to help until midnight GMT. Staylists is a unique concept too. We differ from traditional OTAs in three ways: price, curation, and audience. Other OTAs normally charge between 15%–18%, but Staylists never takes more than 10% commission + VAT. Secondly, all Staylists-powered sites are curated in line with a brand’s audience and expectations. Other online travel sites are a minefield – hoteliers are lost amongst a sea of accommodation providers, and guests are swamped with too much choice. Thirdly, we never have to compete for an audience, as this is already taken care of by the brand. Did you have to introduce any new features that you didn’t need at the beginning? Either to Inn Style or to Staylists? We’ve introduced new payment gateways and more flexible OTA connections to Inn Style, and further updates in the pipeline include a partnership with Kobas (a cloud-based hospitality management service), and an integration with Xero. Change has also been integral for Staylists. In the past 12 months, we’ve integrated with key property management systems and channel managers, allowing us to reach a vast number of hotels. Integrations with Guestline and SiteMinder connected us to 1,500 and 5,000 UK-based hotels respectively, and we'll be integrating with Eviivo and DerbySoft imminently. How do you maintain a balance between introducing new features and keeping the platform simple and understandable? We want Inn Style to be the best property management system on the market, so we always welcome feedback and feature suggestions. That doesn’t necessarily mean we implement all requests, but we always see if we can action the improvement without jeopardising the system’s simplicity. Do you have any examples of such features? We've recently introduced 'Promos' for Staylists customers, which gives accommodation owners greater flexibility when offering discounts across Staylists’ sites. As you can imagine, the subsequent promotions have proved a huge success. With Inn Style, we’ve improved our website builder, added customisable user roles, and will be revamping our Price Updater in the next few months. Have you observed any changes on the hotel market within the time of your operation? I think the main change has been the maturity of distribution through online travel agents. There used to only be a couple of major players, but sites such as Airbnb have completely changed the way in which guests travel. Many people are now looking for smaller boutique accommodations rather than large chain hotels. How much has your business changed since the launch? Inn Style began with a team of five, but there are now 14 of us – so we’ve expanded a fair amount over the past few years! Only a handful of properties used our system when we started, but there are now over 1,000. Staylists has also expanded significantly. We launched our first site, Mail Breaks, with 125 hotels, but the number has now grown to over 600. Integrations with Guestline, SiteMinder, Eviivo and DerbySoft will allow us to onboard a further 10,000 hotels onto the platform. What were the biggest successes of your products? We’ve partnered with some of the biggest names in the hospitality industry, such as Guestline and SiteMinder. Integrating with such key players is a fantastic achievement. The biggest success, however, has to be the partnership between Staylists and Mail Travel (part of the Daily Mail group). This is hugely significant given that the Daily Mail is the UK’s most popular newspaper. What are the most common benefits of the platform your customers mention? Inn Style customers constantly thank us for being the most straightforward system on the market. Many people choose us as their first online booking system, so they’re after something that's user-friendly but still looks good on their website. Our customer service is also highly valued – we answer the phone within two rings, and there’s no frustrating ticketing system. Staylists customers love that we take care of their account setup and seamlessly integrate with their channel manager. The low commission charge is also a huge benefit, as it means the hotels keep more of their revenue. There are lots of exciting updates for Staylists in the next few months. We’re partnering with some huge brands, and also building our own destination-based sites. Our aim with Inn Style is to increase the number of hotels using our PMS. It’s great that word of mouth has played such a significant role in the expansion of our business, but we’ll also be drumming up our marketing activity as we move into our fifth year.